2. TPA-1060 1030-1090 MHz Entire Band 2.14 dBi. 5. DME-1100 960-1215 MHz Entire Band 9 dBi. DME-1100 antenna is rugged all weather model uses 6063T6 ultra corrosion resistant architectural aluminum alloy and does not require any field tuning or adjustments. The DME-1100 is an Omni-directional broadband, higher performance, collinear dipole type phased array designed specifically for use as a distance measuring equipments (DME) antenna. The DME-1100 is a center fed design which eliminates the distortion of the radiation pattern and ensures a true omni-directional horizontal pattern. The special stub matching is used for smooth VSWR and constant gain over the entire frequency band. This DME antenna consist of large diameter brass radiating elements stacked vertically, fed in phase and enclosed in fiber glass tube. UAT-978-1090 Universal Access Transceiver antenna is a dual band vertical polarized, omni-directional L band antenna operating from 960-1220MHz, compliant with UAT (978MHz) and ADS-B (1090MHz) frequency bands. This antenna also supports 1030-1090MHz (ATC Mode-S) and 976-1213MHz (DME) applications. This UAT antenna is a multi band, an Omni-directional broadband, higher performance, coaxial dipole type antenna designed specifically for use in aircraft for UAT application. The UAT/ADS-B/DME antenna uses extended stub in order to keep the radiator away from aircraft so that the interference caused by aircraft body could be minimize. The antenna does not use any junction to prevent RF inter-modulation and is completely protected within a high-tech ruggedized fiber glass radome to ensure survivability in the worst environments. The compact size of UAT antenna allows easy handling and shipping. 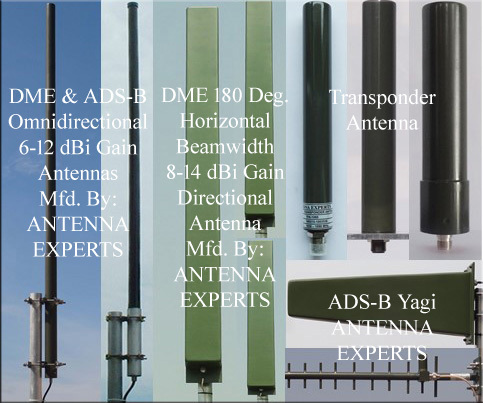 The UAT, ADS-B, DME antenna is free from ground plane and can be installed on metallic or non-metallic surface which eliminates the distortion of the radiation pattern and ensures a true omni-directional horizontal pattern. Two holes of 11mm diameter are required to mount the antenna. Two stainless steel studs are supplied with the antenna to mount the same of aircraft body. ADS-B Series Fiberglass Omni-directional Collinear Antennas are rugged all weather model uses high class brass and 6063T6 ultra corrosion resistant architectural anodized aluminum alloy and does not require any field tuning or adjustments. No ground plane is required to operate this antenna. The ADS-B-1090-12 and ADS-B-1090-9 antennas are an Omni-directional narrowband, higher performance, collinear dipole type phased array designed specifically for use as a ADS-B ground station antenna. The ADS-B Series antennas are a center fed design which eliminates the distortion of the radiation pattern and ensures a true omni-directional horizontal pattern. The special stub matching is used for smooth VSWR and constant gain over the specified frequency band. The bandwidth of the ADS-B series are antenna is fairly narrow, which can help to eliminate inter-modulation problems from adjacent strong signals in urban areas. DME series antennas is rugged all weather model uses 6063T6 ultra corrosion resistant architectural aluminum alloy and does not require any field tuning or adjustments. No ground plane is required to operate this antenna. The DME-960-1240-12, DME-960-1240-9 and DME-960-1240-6 is an Omni-directional broadband, higher performance, collinear dipole type phased array designed specifically for use as a distance measuring equipments (DME) antenna. The antenna termination is enclosed at bottom of the antenna for complete weather protection. The high gain DME series antennas are strong enough to withstand an ice storm, and will also do well in a shoreline environmental conditions. The marine grade stainless steel mounting hardware is supplied with the antenna. All the DME series antennas supplied coupler and two monitoring probes for monitoring the radio signal radiated by the antenna are supplied with the antenna, however this could be optional. Probe output level is 25 dB ± 1 dB below power level applied to main RF input connector. The coupler is suitable to mount on the same mast near the antenna. Transponder antenna is rugged all weather model uses ultra corrosion resistant beryllium copper with chromium finish and does not require any field tuning or adjustments. This transponder antenna is an Omni-directional broadband, higher performance, quarter wave top loaded stub monopole type antenna designed specifically for use in aircraft for transponder application. The DME series antenna does not use any junction to prevent RF inter-modulation and is completely protected within a high-tech ruggedized fiber glass radome to ensure survivability in the worst environments. No ground plane is required to operate this antenna. Transponder antenna radiator is mechanically captivated and is machined from solid brass for impact resistance. Contact points are made from beryllium copper with gold finish. Metallic parts are plated with bright chromium for corrosion protection. A single 0.625” (16mm) diameter hole is required to mount the antenna. This transponder antenna is a center fed design which eliminates the distortion of the radiation pattern and ensures a true omni-directional horizontal pattern. The special top loaded quarter wave stub monopole matching is used for smooth VSWR and constant gain over the entire frequency band. The antenna termination is enclosed at bottom of the antenna for complete weather protection.